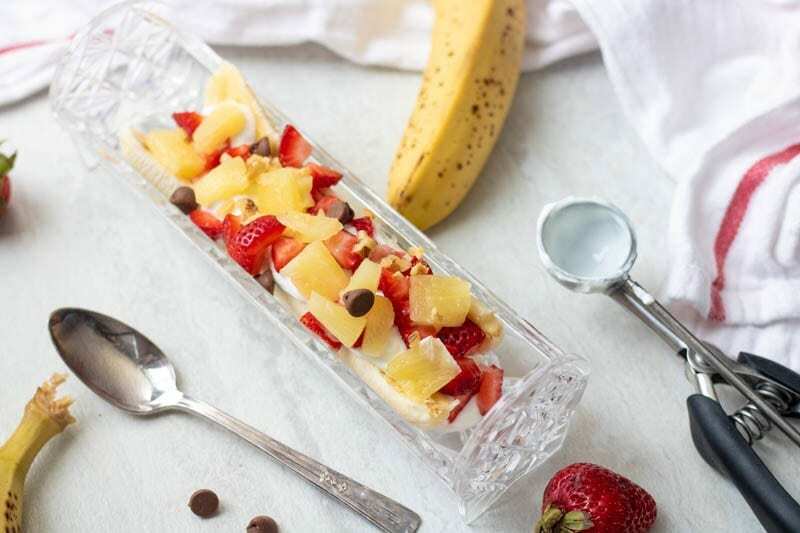 Healthy Banana Split Sundae: Fresh bananas, pineapple and strawberries are topped with yogurt, chocolate and chopped nuts for the healthiest Banana Split Sundae you have ever had–a delicious snack or healthy breakfast guaranteed to make you lick your lips! When the afternoon hits, I need a snack. 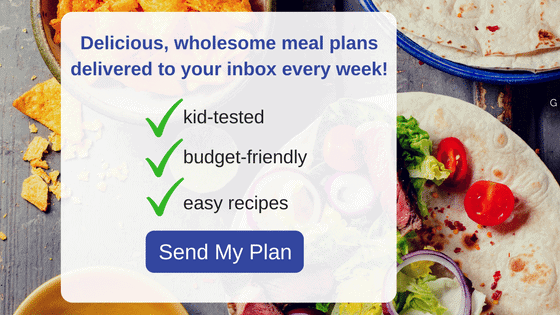 My kids need a snack too–like the moment they walk drop their book bags as they walk in the door from school. 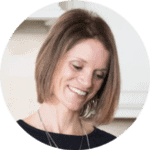 Most days, I have no time to pull together anything fancy–and it may just be a piece of fruit, some pretzels, or a Blueberry Muffin pulled from the freezer. But still snack time remains a special time for us. It is a time for them to open up about their days and to fuel up their brains as they gear up for homework. I have found that I can get the kids to open up a bit more about their days if we sit down together over a “special” snack. Special does not mean complicated or unhealthy. Take my Banana Sushi–a minute decadent, yet healthy treat. I also like to make easy yogurt sundaes. Remember a good old-fashioned banana split? 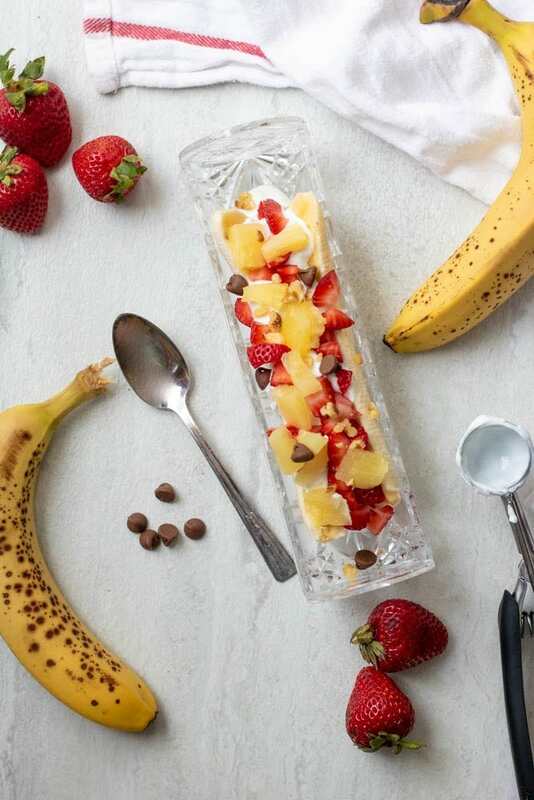 Bananas and ice cream topped with the iconic strawberry, pineapple, and chocolate flavors. And then slathered in whipped cream and sprinkled with nuts. Decadent and delicious, but not exactly healthy in any shape or form! I am taking those classic flavors and making a fresh fruit sundae. There is really no recipe for this banana split yogurt sundae. It is just a matter of assembly. Slice open a ripe banana lengthwise and lay in long sundae dish or even slice a banana in a bowl. Top with plain Greek yogurt. I like to use a mini cookie scoop to scoop out my yogurt, to make it look like ice cream scoops. Totally unnecessary, but fun! Top the yogurt and banana with fresh diced strawberries, pineapple tidbits, chocolate chips and chopped nuts, if desired. Feel free to omit the nuts for a nut-free Banana Split Parfait. If you don’t have chocolate chips, you can use chocolate syrup or shaved chocolate as well for this Banana Breakfast Parfait. This Banana Yogurt Sundae is a perfect snack or an easy healthy breakfast recipe. A healthy spin on a decadent banana split. This recipe is made with bananas, Greek yogurt, fresh pineapple and strawberries. 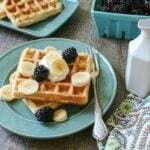 Perfect for breakfast or a snack. Slice banana lengthwise and place in bowl. Add strawberries and pineapple. Top with yogurt. Sprinkle/Drizzle with chocolate. Add nuts if using. And there you have it–a five minute treat that will make you a rock star with your kids! If only this Sundae would get them excited about homework, then we’d really be talking! Check out more of my healthy after school snack ideas over at Don’t Waste The Crumbs. Some times the simple recipes are the best! My kids would love this and I love that you put it in a fancy glass! When present simple in a fun way, it ALWAYS goes over better. Hope your boys love this! I love this idea…it’s simple and perfect! Great for after school. So simple and so great for after school. Sounds tasty, and I can imagine a winner with the kids! Thanks Valerie, sometimes the simpler foods presented well is the best! All the flavors of a traditional banana split and none of the dairy that doesn’t like me anymore! Yeah! I’m just getting around to reading all the interviews at Daily Meal. It is always nice to find a new blog! This looks great! Looks delicious Kristen! Love the dark chocolate with the fresh fruit. Mmmmm…. And now I see how you stay so thin. I would totally have this for dessert but mine would be bigger 😉 Thanks for linking up at #SaucySaturdays. HA!! Trust me, this is totally guilt free–no matter how large you make it!